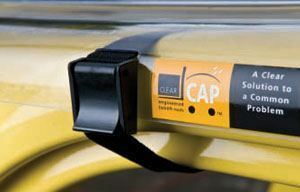 The ClearCap design is simple yet very effective. UV resistant polycarbonate is molded into a cover which has a low profile dome in the viewing area along with ribs and gutters. This keeps water from pooling and blurring the operator’s vision and eliminates cascading water during maneuvers. The basic concept is to keep the operator dry and comfortable while providing outstanding visibility and safety. 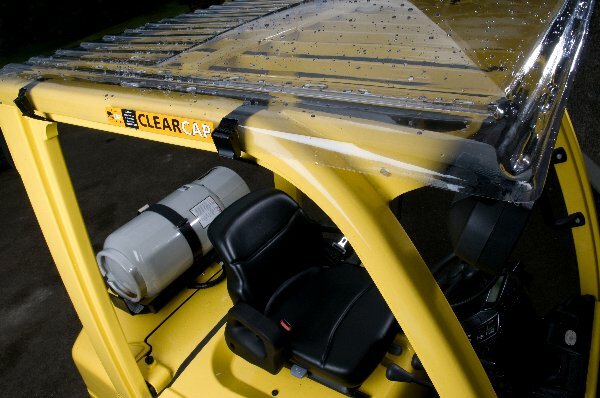 ClearCaps are tough, rigid and extremely clear. The product is also offered in a light tint for those working outside in bright sunlight. 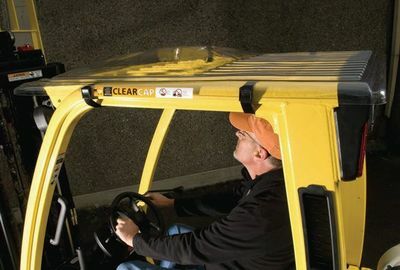 Both clear and tint block 100% of UV light transmission. Operators are protected from both inclement weather and dangerous UV exposure. The units mount simply with the new and improved cam lock buckles and nylon straps. There is no drilling or tapping required and installation takes only seconds. ​CONTACT US FOR PRICE AND AVAILABILITY!